Assembles seasoned founding team from Salesforce.com, LinkedIn and Trulia with over 50 years of domain expertise in marketing and big data analytics. Aims to elevate marketing’s role in the B2B revenue cycle through its analytics suite, providing marketers with the tools to accurately attribute, forecast, and benchmark their efforts. BrightFunnel connects marketing efforts to revenue results. We're delighted that this ‘Dream Team’ of marketing cloud leaders has come together to support BrightFunnel's vision to turn marketing into a revenue function. BrightFunnel’s founding team is comprised of technology veterans with over 50 combined years of domain expertise, and over $900 million in combined exits. Nadim Hossain (CEO), Nisheeth Ranjan (CTO), and Ranjan Bagchi (Lead Architect) have experienced success at market leaders such as Salesforce.com, LinkedIn, Netscape and McAfee, as well as early employees and executives at successful startups, including Trulia, PowerReviews and LiveOps. BrightFunnel aims to transform marketing from a cost center into a revenue function, giving B2B boards and executives full control and visibility into marketing’s direct impact on revenue. CMOs struggle with this today, due to the rapid pace of marketing efforts, the volume of data, and the lack of tools for forecasting, benchmarking, and attribution. BrightFunnel combines a complex machine learning backend with a highly usable interface to allow marketers to tie their efforts to revenue. Through BrightFunnel, CMOs will know how much revenue their efforts will generate and which decisions will have the best impact on revenue growth. Offering predictive revenue insights out of the box, implementation can take as little as 24 hours, and the system is fully compatible with all major marketing automation systems — including Marketo, Eloqua, Pardot, Act-On, and Hubspot — and can gracefully overcome data quality obstacles. Additionally, BrightFunnel plans to offer network-wide intelligence, allowing every customer to benefit from the presence of every other customer through benchmarking data, much like Google Maps, which recommends better routes based on real-time user data. BrightFunnel is currently revenue generating and is on track to hit profitability in the next year. It counts both mid-market and large enterprises among its customers. This round of financing will be spent on product development and customer growth. The company has not taken any institutional funding to date. BrightFunnel provides CMOs with full visibility and control over their direct impact on revenue. 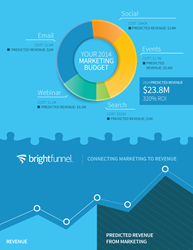 BrightFunnel’s vision is to transform B2B marketing from a cost center into a revenue driver. Enabling marketers to attribute, forecast, and benchmark their efforts through easy-to-use big data analytics, BrightFunnel’s marketing cloud solution is easy to implement and provides teams with immediate, actionable revenue insights. Its current customers include HootSuite and ExactTarget. For early access to this technology, join BrightFunnel’s Innovator Program: visit us at http://www.brightfunnel.com.